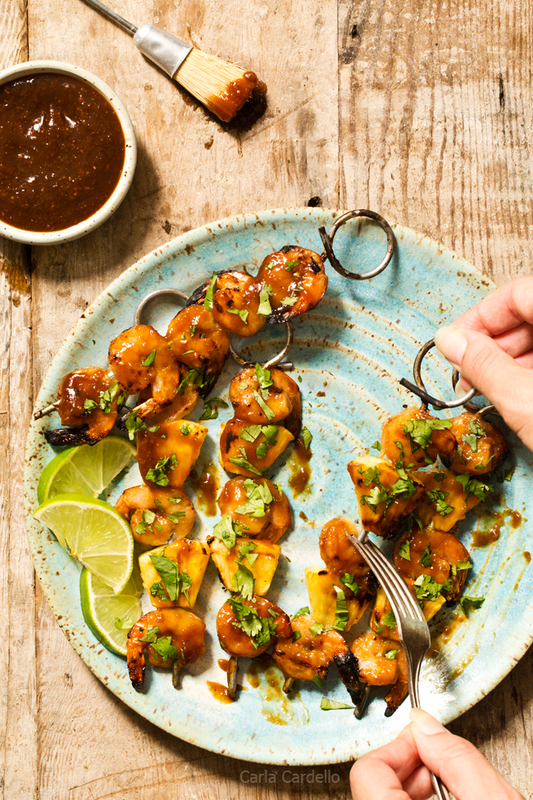 Fire up the grill for Grilled Pineapple Shrimp Teriyaki Kabobs with a homemade pineapple teriyaki sauce and grilled pineapple. Right now as you’re reading this, I’m either drowning in boxes, throwing bubble wrap everywhere, or eating ice cream. I got the keys to my new apartment last week, so I’ve been driving back and forth moving my stuff carload by carload. Making sure I’m there for utility appointments (a 4 hour window you say? Why no, I’m not doing anything important with my time. What’s that? You have to come back another day because you got called to an emergency? Sure. I’ll take off work again). Next week is when the movers will transfer my furniture and will finally be at my new place for good. Then of course comes the cleaning and unpacking. I hope this place is everything and more because I never want to deal with moving again. I’m mostly excited for the new kitchen. It has at least three times the counter space and six more outlets than my old one. It’ll also have a giant window! My friend joked it was both funny and sad I’m this excited over basic necessities in the kitchen. I still don’t know how I survived with three tiny counters and only one outlet when my job literally depends on it. One downside is I will no longer have a balcony. Not a huge loss since I rarely sat outside anyway, but it was handy when I wanted to use my tabletop grill. With Labor Day coming up and summer ending soon, I wanted to do one last hurrah on my grill before packing it all up. Shrimp is my favorite protein, so I thought about what would pair well with it. Soon my mind started wandering towards Asian flavors. When I worked at the mall in high school, I loved walking around the food court getting free samples of chicken teriyaki. Of course when I actually ordered there on my break, I went for the shrimp. I can never say no to shrimp. 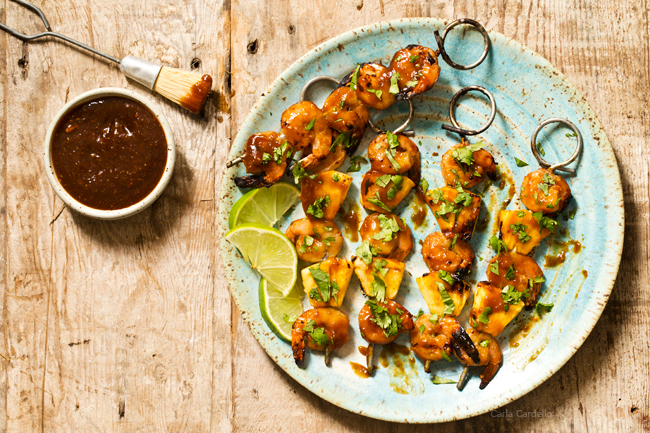 That was the inspiration behind these Grilled Pineapple Shrimp Teriyaki Kabobs. Plus the shrimp grill up fairly quickly, so that’s always a bonus. I mean, who’s ever said no to making a quick and easy meal? I first discovered the pineapple teriyaki sauce from the Bountiful cookbook. The pineapple adds a nice sweetness to the soy sauce. Plus since you’re buying a whole pineapple anyway, you can grill up the remaining pineapple. Also why does eating too much pineapple make your tongue numb? Actually I do know the answer – it has special enzymes that breaks down the protein in your tongue (yikes). It’s so annoying. If I could eat an entire pineapple in one sitting without losing feeling in my mouth, I would. And if you’re grill-less like I will be next week, you can easily broil these skewers in your oven. Alternatively you can bake them for about 5-10 minutes or until the shrimp are cooked through. In a blender, blend together 1 cup pineapple, soy sauce, ginger, garlic, brown sugar, vinegar, and oil until smooth. Transfer the sauce to a medium saucepan and bring to a boil over medium-high heat. Once boiling, cook for another minute. In a small bowl whisk together the cornstarch and water until smooth. Add to the boiling sauce. Stir until the sauce thickens, another 1-3 minutes. Remove from the heat and cool completely. Reserve half of the sauce for brushing. In a plastic zip-top bag or container with a lid, combine the remaining sauce with the shrimp. Marinate in the refrigerator for 30 minutes. Prepare an outdoor grill for medium-high heat. Alternatively, prepare an indoor broiler. 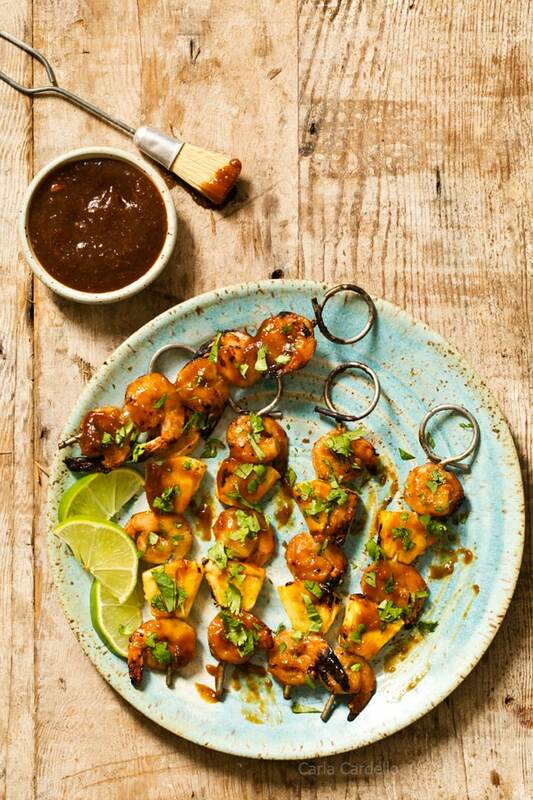 If using wooden skewers, soak in water for 10 minutes. 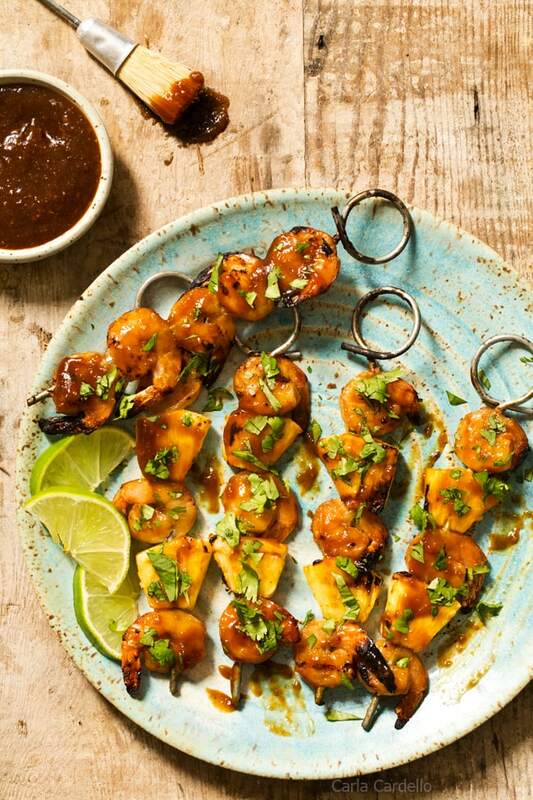 Remove the shrimp from the marinade and shake off any excess sauce. Discard marinade. 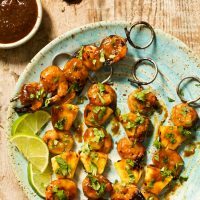 Alternately thread shrimp and remaining pineapple (you may have leftover pineapple, depending on the size of your pineapple and skewers). Grill kabobs, covered, over medium heat for 3 minutes. Flip then cook another 3 minutes until the shrimp are pink and no longer transparent. Remove from the heat. Brush remaining sauce on kabobs and serve immediately. I have a bottle of teriyaki sauce sitting in my kitchen. Making it from scratch sound so much better! On the moving issue, it’s a lot of work but exciting to have a better kitchen. Now that I’m through the move, I’m excited to have counter space! However, I underestimated how many extra steps I have to take because of said extra space LOL Homemade teriyaki sauce is highly recommended after you finish your bottle, especially with the added pineapple in mine. Enjoy!